WebRTC is a Web API, present in the majority of browsers (including Safari as of this September), that allows the interchange of information without intermediaries, in a peer-to-peer fashion. With WebRTC, it is possible to implement the necessary infrastructure for persisting the experiences integrating the metaverse. The biggest complexity of WebRTC arises from session management, peer discovery and signaling, all necessary to identify the connections between browsers. Once peer identities have been established, the standard can provide end-to-end channels for sharing media and data. To bring the power of WebRTC to A-Frame users, I’ve been developing the sharedspace component. The component provides a collaboration model where participants can join or leave a named space, share audio and state, and send JSON-serializable objects to other peers. The component does not deal with the WebRTC API directly. Instead, it uses a modified version of webrtc-swarm as a wrapper library. I chose it for its simplicity, footprint, clarity of the source code, and ease of use. You can experiment with some VR chat on Glitch or browse the project to learn more about the sharedspace component. The repository includes extensive documentation with explanations and examples of other common use cases. The sharedspace component is not a general network solution for A-Frame and it does not come with a straightforward way of sharing entities among multiple instances of an application. However, the ability to send data means it’s possible to create new forms of collaboration built on top of this component. For a more general network component, take a look at the networked-aframe component by Hayden Lee. The sharedspace component requires a browser with WebRTC support which means any recent version of the most popular mobile and desktop browsers. Chrome also requires the page supporting WebRTC to be served on HTTPS unless you are serving from localhost. However, the code above will always connect to a room named room-101 and the avatar representations will be red spheres, which are not an effective representation of human participants. Let’s customize the settings to change this. You can follow along with me as I customize the code using this same minimal setup on Glitch: remix the project. Important: To test your progress, you will need at least two clients connected to the same room. While testing, you will notice the peers are connected because the camera resets and the app no longer allows you to move the avatar around. When this happens, look for a red ball: this is the other peer. Click to see the effect of connection on the camera. The most important part is the last line where you set the name of the room and reset the hold property to false, allowing the component to connect. Suppose I want to have a VR talk with a friend. I enter the bare URL in Firefox, on the left and the webpage automatically appends the room name and connects. Now I share the new URL with my friend who pastes it in Chrome, on the right. The avatars component is available when installing the sharedspace component. It manages the A-Frame scene to provide an avatar representation to each participant. By default, the avatars component will search for a template tag and use its content for instantiating the avatar. Click and see how looking around on the right tab moves the avatar on the left tab. Not knowing where the camera is pointing when you connect can be annoying. Let’s fix that. When a participant joins the room, the avatars component instantiates the avatar template and emits an avataradded event on its entity. This allows dynamic configuration of the template. Notice that avataradded does not guarantee that the avatar entity has loaded. You should wait for the avatar to completely load before it’s safe to alter other components. The code uses the underlying Three.js API to calculate the correct orientation of the avatar. The next time you load the experience, the browser will ask for permission to share your microphone. If the participants grant permission, the positional audio for the A-Frame avatars will be automatically managed by the avatars component. Positional audio means the sound will be panned left or right according to the relative position of the listener (i.e., the camera). Wearing headphones or earbuds enhances this effect. You may have noticed that the avatar representing the user has a special treatment. Because its avatar ‘carries’ the camera, when you look around your orientation is shared by the other participants. By default, avatars will add some specific components to the user’s avatar. You can control which components should be applied to the user’s avatar using A-Frame mixins. Mixins are component containers, and entities can set the mixin attribute to a list of mixin ids to inherit their components. The share component (also available after registering sharedspace) indicates which components should be kept in sync among other peers. By setting the property onmyself of sharedspace to the id of the mixin, you’re instructing avatars to add that mixin to the user’s avatar. The sharedspace component allows the user to send messages to other peers. You’ll use this feature to force a change into the preset environment when pressing the spacebar. // Here comes the code to send and receive message…. Get and share the name of the participants. Alter the order in which the participants appear by experimenting with the placement property. Try to implement shared room-state on the top of participant messages. 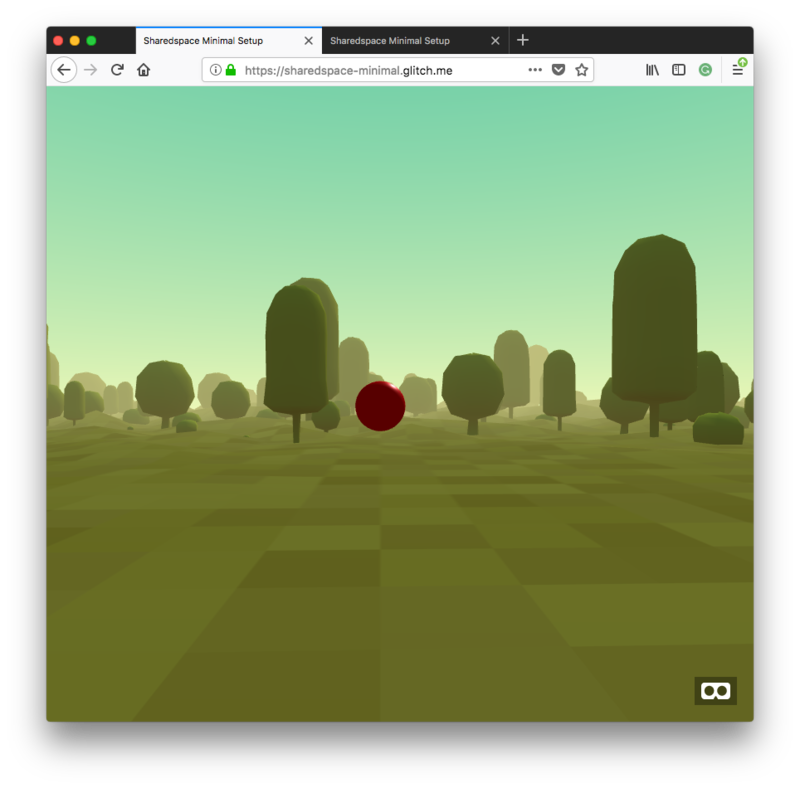 The component repository includes an extensive explanation of the components API and a template VR Chat project on Glitch, including a source guide to get you familiarized with the components quickly. Looking for more ideas? Here is another multi-user application powered by sharedspace in the Unbirthday Room. Multi-user applications are not limited to chats: other participatory experiences fit the sharedspace model. Even if the proposed participation model is limited, other components can build on top of it to enable new interactions. Now it is your turn to build a multi-user experience: install A-Frame and sharespace, hack, capture a demo, and let us all know about it by mentioning @aframevr on Twitter. Join the active Slack channel and tell us about your collaborative experience.